The International Day of Women and Girls in Science highlights the achievements of female scientists, and is celebrated on February 11 this year. Here we highlight eight women contributing greatly to the conservation sciences. The study and advancement of science is one key to achieving the world’s agreed-to development goals, the UN says. Despite this, half the world’s population, women and girls, are still often excluded from fully participating in science. According to UNESCO, less than 30 percent of researchers worldwide are women. The International Day of Women and Girls in Science highlights the contributions and achievements of female scientists, and is celebrated on February 11 this year (follow along on Twitter via the hashtag #WomenInScience). For the episode How to use drones without stressing wildlife, Gaworecki’s guest was Alicia Amerson, a marine biologist, drone user, and science communicator. She explained why it’s critical to have best practices for drones in place not only to guide hobbyists making videos of whales or birds, but especially before companies like Amazon deploy fleets of drones in our skies. For the October 2018 show How an African bat might help us prevent future Ebola outbreaks, Gaworecki spoke with Sarah Olson, an Associate Director of Wildlife Health for the Wildlife Conservation Society. With Ebola very much in the news lately due to a recent outbreak in the Democratic Republic of Congo, Olson explained to him how research into hammer-headed fruit bats might help us figure out how Ebola is transmitted from animals to humans — and potentially control or prevent future outbreaks of the viral disease. As a wildlife epidemiologist, Olson’s main focus is great ape health, animals which are just as susceptible to the Ebola virus as humans are. Her work to protect great apes has therefore drawn Olson to study the hammer-headed fruit bat, which is believed to be a potential “reservoir” for the Ebola virus. Our guest in October 2018 was Dr. Michelle LaRue, a research ecologist in the Department of Geography at the University of Canterbury who is leading a research project using satellite imagery together with ground and flight surveys to compile population estimates for each of the 54 known emperor penguin colonies in Antarctica. The project’s goal is to compile population estimates every year for an entire decade. When reached for the episode Documenting emperor penguin populations, a dispatch from Antarctica, LaRue had just arrived at McMurdo Station, a research center at the southern tip of Ross Island, on Antarctica’s McMurdo Sound. You can subscribe to the Mongabay Newscast on Android, the Google Podcasts app, Apple Podcasts, Stitcher, TuneIn, RSS, Castbox, Pocket Casts, and via Spotify. 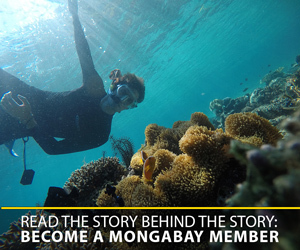 Or listen to all our episodes via the Mongabay website here on the podcast homepage. Banner image: National Park Service fisheries staff, 2016, image courtesy of U.S. National Park Service.